More than a thousand live tropical butterflies fly freely in the glass conservatory at the Sophia M. Sachs Butterfly House. Watch a butterfly emerge from a chrysalis right before your eyes. Or go outside and visit native and migrating species in the Butterfly Garden. Take a class, shop until you drop, or plan a private party on the Emerson Lakeside Terrace. Whatever your age, you'll enjoy a visit to the Butterfly House, where wonder takes flight! 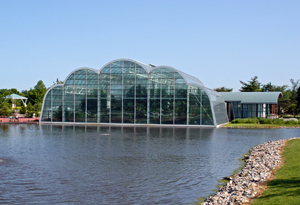 The Butterfly House is located in Faust Park. Faust is a St. Louis County Park in Chesterfield, Missouri off Olive Blvd. The park has several attractions in addition to the Butterfly House. Visit their website for more information.